DUNGEON OF TERROR contains 164 rooms, 8 different zones (each one featured in a single product) and it’s broken in 225 customizable tiles. 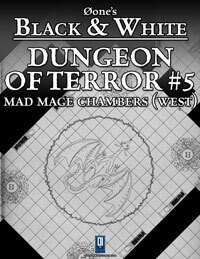 This product details the west part of the Dungeon of Terror, another set of unconquered hall designed by Infidus the Black himself. These are very large rooms hiding unexpected dangers. It contains a Referee Map and 28 customizable tiles. This product line brings you simple tiles for your favorite RPGs. In each product you will find a whole fantasy location fully fleshed out in miniature-scale tiles with the usual Øone’s top-notch customization capabilities. 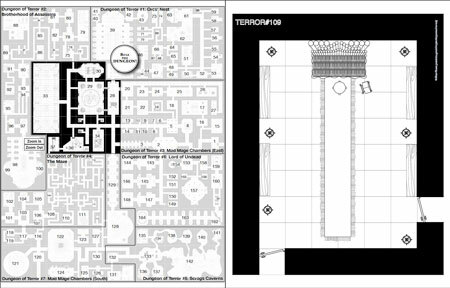 The B&W maps are simple, line art battlemaps you can customize to suit your needs and then print. This Øone’s exclusive feature allows you to customize the look of your map by adding the furniture, toggle the grid, hide the room numbers and much more. On the Referee Map, you will find a big “Rule the Dungeon” button. By clicking on this button some options will be shown, as detailed below. A checkmark will appear beside the options active. • Text: toggle room numbers and tile numbers. • All: toggle default state/empty state (with just the walls).